Attitude is Everything, Constant Flux and DIY Space for London are holding a weekend of talks, performances and workshops. This will be celebrating DIY Space For London being the first volunteer run venue in the UK to receive Bronze Accreditation for accessibility from Attitude Is Everything. a musician or artist involved in London’s DIY (Do-It-Yourself) music scene? a promoter putting on gigs in grassroots venues? a live music fan with a passion for DIY gigs? 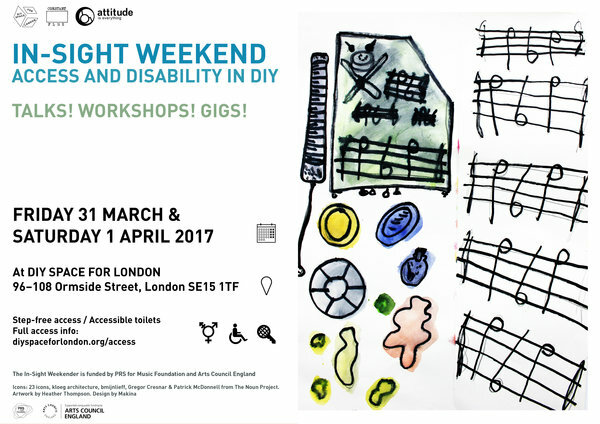 a musician or gig-goer with access requirements and want your voice heard to make things more accessible at DIY and grassroots gigs? – BSL interpretation is available upon request for the talks event. To book this, please contact Jacob on 020 7383 7979 or email jacob@attitudeiseverything.org.uk no later than Thursday 14th March. The learning and case-studies capturing over the In-Sight Weekender will be condensed into a new zine-based guide on how to make DIY and grassroots gigs and tours accessible and a UK-wide campaign to sign-up bands and artists to implement its recommendations in their practice. This guide will be designed to empower artists to affect meaningful change in partnership with grassroots venues, increase diversity on stage at their gigs, and reach new audiences. The In-Sight Weekender is funded by PRS for Music Foundation and Arts Council England.